A WordPress tag is one of the default tools you can use categorize your WordPress posts. Each post can contain multiple tags and visitors can click on a tag to find similar posts that have that same tag. Unlike WordPress categories, tags are completely optional. That is, you’re free to add WordPress tags to your post, but you can also publish a post without tags. The choice is yours! WordPress Tags vs Categories: What’s The Difference? On a technical level, both tags and categories are types of taxonomies. A taxonomy is just a fancy word for a way to group things together (like your WordPress posts). Categories are hierarchical, while tags are not hierarchical. Basically, this means that you can have a parent category with child subcategories. But with tags, there are never any parent/child relationships – each tag is a 100% standalone entity. While categories should be broad topics that apply to many different posts, tags are usually more specific and unique to the actual content in that post. 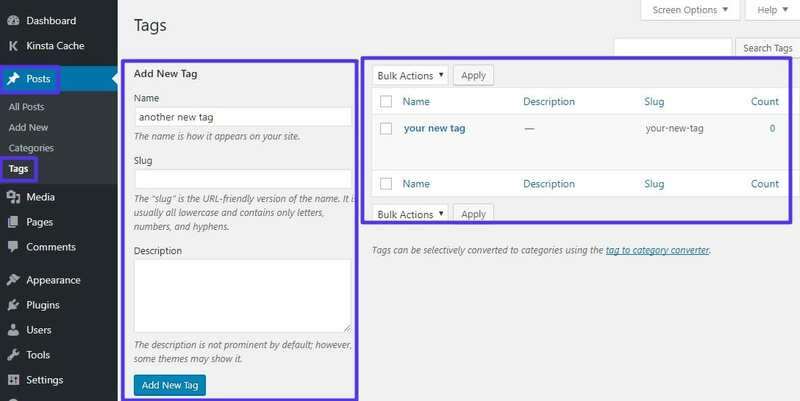 WordPress gives you two easy ways to add tags to your site. 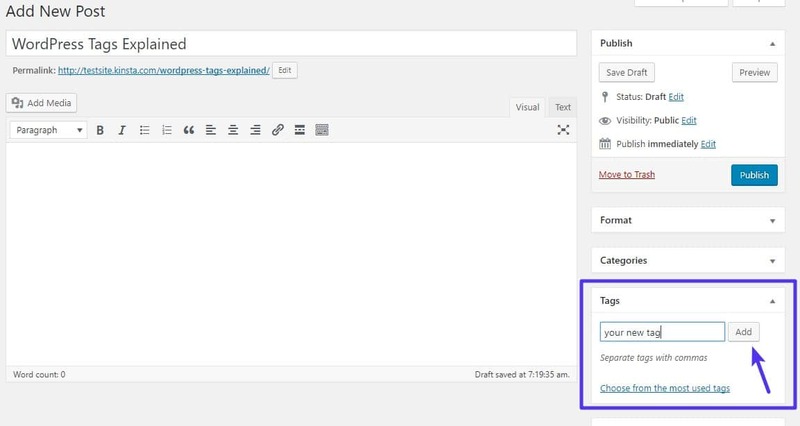 Most WordPress themes will automatically display the tags assigned to a post as part of the post’s metadata. Usually, these tags will be shown at either the beginning or end of the post. If desired, though, you can also use a WordPress widget to easily display all of the tags that you’ve used on your site as part of something called a tag cloud. 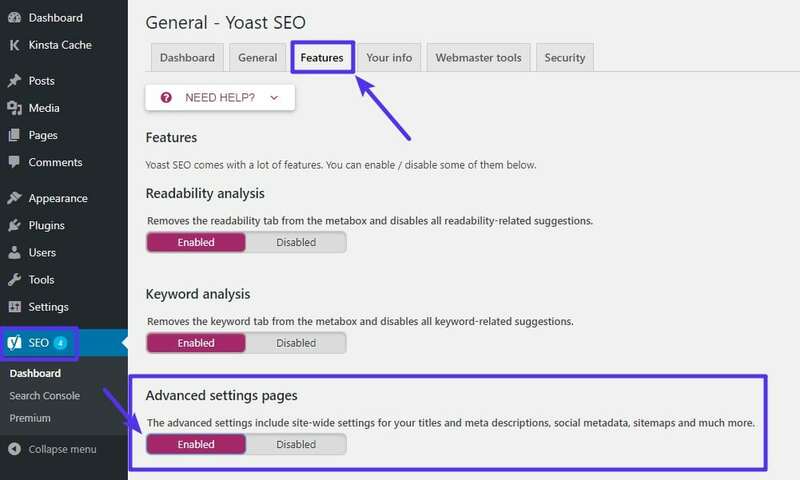 While WordPress tags are often helpful from a usability perspective, there are some SEO best practices to follow to ensure that your use of tags doesn’t have any negative effect on your site’s search engine optimization (SEO). By default, each tag that you use creates a separate archive page that lists all the posts using that tag. That’s good for humans because they can easily find similar content – but for search engine robots, it creates lots of low-quality duplicate content pages (because all your posts are also listed on your main blog archive page, as well as each post’s individual URL). Rather than wasting Google’s time with these tag archive pages, a better approach is to use the noindex directive to tell Google not to bother indexing your tag archives in the first place. 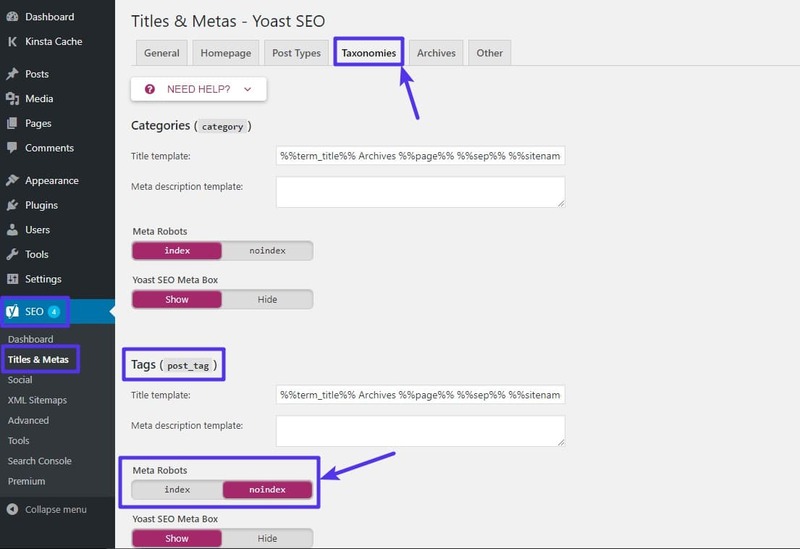 The easiest way to noindex WordPress tag archive pages is via the free Yoast SEO plugin. Assuming you already have the plugin installed and activated, here’s how to do it. Now, your tag archive pages will still function regularly for humans, but Google and other search engines won’t index your tag archive pages and create duplicate content. Beyond front-facing usability, you can also use WordPress tags in creative ways with certain WordPress plugins. For example, here at Kinsta we use the Easy Social Share Buttons for WordPress plugin to help visitors share our posts. With this social media plugin, we can make it so that if a visitor clicks the button to share one of our posts on Twitter, Easy Social Share Buttons will automatically pre-populate the Tweet with hashtags based on the tags used on the post. So even though we don’t display tags publicly on the Kinsta blog, we still use them behind the scenes to help fine-tune our social media sharing strategy. Depending on the specific plugins that you’re using, you might be similarly able to get double-duty from your WordPress tags. 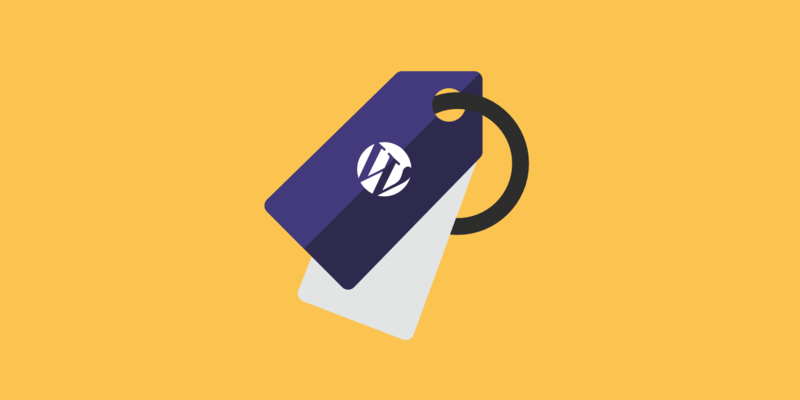 And that wraps up our explanation of WordPress tags! → What Is a WordPress Plugin?